Smart things come in slim packages - the TK-2360/3360 radios which offer top-notch performance and a rich feature set – all in a conveniently compact design. Easy to use, yet tough where it counts: IP54/55, MIL-STD weatherproofing means they never complain about the weather. Smaller, thinner and lighter – these radios are ideal for hooking on a belt or even slipping into a coat pocket. Kenwood engineering advances have resulted in a compact, ergonomic design that is easy to grip and operate, even with gloved hands. The tough TK-2360/3360 has passed the demanding IP54/55 dust and water intrusion tests. It also meets or exceeds 11 stringent MIL-STD 810 C/D/E/F environmental standards, including “blowing rain”. As an experienced audio specialist, Kenwood can draw on decades of expertise at every step: component selection, construction, optimization, evaluation and analysis. The resulting audio performance, specially engineered for transceivers, is undeniably clearer and crisper. Just listen to the difference. Offering extensive frequency coverage – 70MHz for UHF – the TK-2360/3360 can accommodate a wide range of applications. 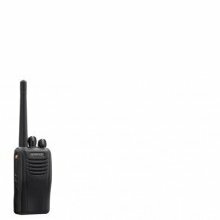 The TK-2360/3360 offers ample capacity for multiple channels or radio systems. And there is now a colourcoded channel stopper to enhance operability when using only a few channels; easy to set up, this feature limits the maximum number of channels to 4, 8 or 12. The built-in programmable voice inversion scrambler provides basic protection against casual eavesdropping. For hazardous / hostile duty environments, the AUX key can be programmed for Emergency use to transmit an alert to a predetermined person or group using DTMF, FleetSync® and 5-tone. Three different staff safe functions are available that make use of the built-in motion sensor. When activated, a “mandown” alert is generated automatically if the radio is not upright for a length of time. Similarly alerts can be sent if the radio is stationary for a preset period or if it is being shaken/swung violently as when someone is running. This ingenious feature provides an extra layer of security for individuals who work in remote or hazardous areas. If there is a long lapse, it will sound an alert. And if the user does not respond to the alert, the TK-2360/3360 will place an emergency call to a predetermined person or group. The radio stun function can disable a lost or stolen radio over the air, thus eliminating security risks. The rotary and key controls on the TK-2360/3360 have been designed to provide the user with voiceannouncement of radio status or mode – convenient when operated undercover or in a pocket. Several languages are available.